Just before me there is a new product from Turtle Beach (*1), the very company that became famous in 1992 on the PC audio market by its MultiSound. Many musicians including R.E.M., Beach Boys, used the company's products. The company has not long produced any new products for those who would like to have "high audio quality at affordable prices". Within the last years as many as 6 (!) modifications of Montego boards have been produced, with some of them being proudly named as Home Studio (*2). Today, however, products of this formerly respected company can be classified only as consumer goods. And at last the outstanding event for everybody interested in high-quality PC audio has accomplished. At the time of writing this article, Santa Cruz sound card was launched and will be soon brought to the market. This report is devoted to comprehensive examination of all its features. *1 At the moment the producer is called Voyetra Turtle Beach Inc. and consists of two firms with different logos. The card was produced by the firm with Turtle Beach logo. That is why, putting away the structural details of the company, we may omit the first word (unless the copyright is mentioned). *2 By itself, the "home studio" term is rather conditional. And the market is in good progress. Products considered as quite good three years ago are outdated today. Nevertheless, it is not fair to provide the card with new software and to call it Home Studio without changing the hardware. Of course, I don't want to simplify anything and the Marketing Department should earn its keep anyhow. New card - new features? To summarize, I will indicate the main features of the card: 20-bit DACs, playback of decoded AC-3 5.1, CPU offloading at MP3 sound reproduction, reprogrammable DSP, extended support of Sensaura technologies. So, let me tell about everything turn by turn. What is hidden in the blue box? Let's come down from the figures to "lyrics". The distinguishing mark of the retail product is its package. As in chiromancy, a lot of can be recognized by a package. In this case I feel emboldened to note the following. The box was made as large as possible to present a card claiming to have great features. A gentle white-blue design seeks to appeal today's average universal user (without focusing on gamers or musicians). 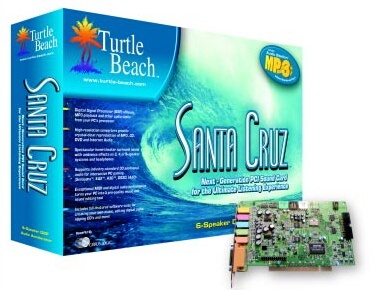 The text below the Santa Cruz title tendentiously reads "Next Generation PCI Sound Card for the Ultimate Listening Experience". As a tribute to the fashion, "MP3" in large type is printed on the right. And the postscript below reads "6-Speaker DSP Audio Accelerator". So, the beginning is rather promising. Let's open the box. I hold only one claim to the software: WHERE is a software DVD-player to enjoy 6-channel audio? Let's read the card help: "Playback of DVD movies with 5.1 surround decoding is not directly supported in Microsoft Windows. As a result, playback of DVD movies with 5.1 soundtracks will require special software. This software is usually supplied with the DVD drive. Please refer to your DVD drive's documentation for more detailed information." Ha, I know who should contact and whom. Those smart men who "jammed" a lot of software for work with MIDI into a universal card but forgot about one unfeatured but significant detail "How can one of the main card's features - Dolby Digital 5.1 reproduction - be realized?" should consult a psychopathist. Well and good, the problem can be solved by 1 minute of searching and an hour of downloading the latest WinDVD 2000 version (I used the 2.1 version). Unfortunately, the most user-friendly and functional player, PowerDVD 2.55, does not support 6-speakers cards as yet. (Yes! During the article translation into English the incoming 3.0 version of PowerDVD has been provided with 6-speakers cards support and CS4630 support also). Of course, there exists Cinemaster 2000 which claims to provide such support but I have not yet found an operative version of the program. The card circuit is given below. Don't be confounded by plastic-colored connectors - it's only a case. There is a tried metal screen inside each connector (except for RearOut). The first strange thing was that computer did not restart upon installation of the drivers from CD. That's nothing to what followed. The software operates improperly and the system constantly "turns" to the "blue screen" or spontaneously restarts. As you may remember from the Platinum report, Yamaha&Vortex and Live operate in this system quite good ("the more the merrier"). I got Santa out and inserted the two old "chaps". No problems! It was clear that there is something amiss with the new card. Oh, all right then, let's download the latest drivers (rather imposing in size - 20 MB), re-install Windows and read FAQs. It seems as if everything is OK, but suddenly you find the information that the card can not operate together with any other sound card. H,m… It is not acceptable for comparison. So, during Santa Beach usage it is necessary to switch Live off in the System. At last many troubles caused by the card are eliminated and it is possible to work. Let's hope that such eccentric behavior is errors of youth but not a sad personality of the card. Only one brand utility is available - Control Panel. In general, the Panel is carefully thought up. There wants but separate volume control for all channels available in the card. I had to open two additional volume controls - Extra Output Device and Second Analog Record - in a standard mixer. So, that's not the half of the story and the main testing is to be performed that is usage of undoubtedly interesting and useful card's feature - reproduction of 6 channels of audio DVD track. How is it worth considering this feature? It is likely that only the feature can be considered only as a cheap mean for adequate Dolby Digital 5.1 as all (or almost all) other components - acoustics and amplifiers - are available. For example, it can be applied as a part of an advanced audio-complex. I think in this country this will be very acceptable, as many users have piled up several amplifiers and Soviet audio-systems rather good by sound at their prices and significantly updated by do-it-yourselfers. And favorite occupation of any true audio-fan is soldering and experimenting with various arrangements and configurations of audio system. Of course it is not a worthy alternative to even the worst DVD-complex equipped with a receiver and audio set at the price of $1000 and up. But it is still better than lately widespread various plastic sets of computer "under-acoustic systems" (or "over-headphones?") both by quality and price. Expansive models are not preferable as their excellent features can not be realized because of acoustic properties of ordinary rooms - just imagine where can you find a 4x5 m separate room with special finishing and without furniture? And it is absurdly to pay money and to bury acoustic systems in room corners aheap with various stuff, to sit into the center of stationary waves and to argue about exceptional sound effects. So, I think it will be more interesting to examine rather cheap variants of arranging such complexes. In our case, the improvised system "zaDOLBIm 5.1" was arranged. Improvised sub-woofer - made from Estonia AS -021 column (30 - 20000 Hz, 30 W). I selected two films to see: "Die Hard-3" and "Matrix" both overfilled with special effects. The sound tracks of the films were recorded in Dolby Digital 5.1 both in Russian and English. Only English-language films are suitable for watching (although Russian dubbing is rather good). We compared the sound of the most exciting moments of the films through 6 speakers and the Santa card and down-mixing to 4 speakers through the Live. From the very beginning I was not sure that is it really necessary to use 6 acoustic systems in ordinary conditions (and with such childish sub). However, I had to admit that connecting of the dedicated sub-woofer and central channel improves the perception significantly. The fact is that AS-3 is an algorithm of compression with losses and that is why it is too "sensitive" to any processing and virtualization of middle channels though the frontal ones inevitably results in quality losses. Subjectively purer high tones of the Santa (in comparison with the Live) make special effect more transparent and natural. The features of Santa Cruz (codecs CS4294-JQ and CS4297A-JQ codecs) were compared with those of SBLive! (*4) Value 4830 (codecs Creative CT1297-TAT and Philips 1330A - front and back respectively). As usual, SpectraLab 4.32.14 program was applied for quantitative estimating of quality features. Those who would like to repeat measurements can download the latest version of the program on the web-site of its authors. Also, we recommend you to read "Personal Computer Audio Quality Measurement White Paper" (PDF, 458 KBytes). *4 The Live was selected as the best sound card by the results of comparing Live!, Vortex2 and Yamha724 reported in the article about Platinum. Journalists call the Santa as "Live killer". As for me personally, I don't like such labels because in the case of competition a new product is at a disadvantage - too increased requirements are imposed on it. Let's remind MX400 which claimed to be a "Live vs. Vortex2 long-expected alternative" but failed to become it. Out of interest, I looked through Santa reviews available in the Internet and written by my colleagues from Doodlenet (unlike Runet) and found a lot of delighted opinions about 20-bit codecs of the Santa Cruz. You did not mishear: not about the card sounding but just about codecs bitness (!) and pure emotional perceptions. Later we will discuss the card sounding. At first let's take a practical view of the producer's specification of the chips. At first about the terminology. Apparently to finally confuse end users, producers think up more and more new names and measure units for measured features of their products. According to Crystal Semiconductor, the dynamic range is a ratio between the signal level of 3 dB within the clipping point 0 dB (or so called Full Scale level) and the noise level at -60 dB signal. They, of course, refer to various engineering standards. Traditional signal-to-noise ratio (SNR) which exactly indicates noise level at REAL conditions is omitted possibly because of its insignificance. The signal-to-noise ratio given in the card specification was derived as follows: the signal was separately measured and then, upon passing the zero-level file with the same recording level (but with FS! ), the noise was registered. SNR was derived by subtracting the first value from the second one. Even under such mild conditions the features for 20 bits were rather disappointing. Furthermore, taking into account the A-weighting, audio accuracy is estimated about 14-bit (! )(20 log (2^14) = 84 dB ~ 87 dB A). And what do you want to get at this price? "JQ" is the cheapest Crystal's codec line. "KQ" is the better and more expensive variant but probably not for the time being (or may be not for this card?). For reference I'll just run through the formula of conversing dB to % for THD+N. The results of the tests are applicable for example to conversing MIDI-tracks to Audio-tracks in a sequencer or to estimating a record quality for those part of an input signal that was processed by board processor of the card. All other sources, equalizers and timbre regulators were cut off. From digital channel output a signal passes through an inner codec mixer to the general digital input (this feature is available due to the AS 97 Standard). For SBLive! This is "What U Hear" and for the Santa Cruz - "Output Mix". To eliminate errors, the tests were performed for a long time (at different record and reproduction levels). The best results were selected for each card. SNR valuae expressed in dB A favorably differ from the above ones just by 2-3 dB. Santa Cruz secondary is a record through the second codec, "Second Analog Record". Codec's loopback is quite good - you would say. But what about the output? The output is equipped with two operational amplifiers from Texas Instruments (I even did not suspect that the company's products can be found among sound cards). They are marked as TLV2465C). They distort sound only slightly but are not much better than Philips products such as TDA1308. Those who are interested in TLV2465C can click on the link and read the detailed manual. Let's find out how sound was "improved" upon passing thought the following test path. So, here goes! The second chain is "computer-DAC-internal cord-ADC-computer". A cord from separate-shielded microphone cables 6 mm in diameter and 10 cm in length and Taiwanese gold-plated "mini-jack" connectors slightly re-bored at a face were used for measurements. The cables were wound into a twisted pair. 1 kHz sinusoidal signal - 3 dB in amplitude was delivered to a linear input with discretization frequency of 48 kHz. (By the way, I have been already criticized and asked not to limit amplitude but to digitize by the lower level. I made such an experiment - with signal 0 dB in amplitude and digitizing at -3 dB and all features remained the same within the measurement error). So, both cards have a pair of codecs. One of the codecs was actually proved to be better than the second one. The difference is minor for the Live but rather significant for the Santa. Thus, it is clear which of the codecs in each card should be used. In this test the Santa was close to the Live by noiselessness and distortion level. I remind once again. Given figures are not absolute value, they are given only for comparison of one card with another one and strongly depend on measurement method (as it was already mentioned above). As for he features claimed by the producer (and given in the table at the beginning of the article), the necessary tests A-D, D-A and A-A can be made only with the help of special equipment. I am afraid that even professional $600 card is not appropriate as a reference card as the range of its features is rather limited. Crystal recommends to use equipment with 16-bit features from 100 dB and up (*5). *5 Of course, the "output-to-input" path is not the best for the test. It would be more appropriate to test D-A and A-D chains separately as they support different processes. Unfortunately, the price of high-quality measuring equipment applicable for this purpose is $28,000 and up, even a day rent of such equipment is close to the card price. The obtained values of the card features impose the corresponding requirements on the reproduction part of the audio-complex. Features of the amplifier and acoustic system are given above in the section devoted to DVD. To estimate cards sounding it is essential for any audio-complex to have some margin of features so as it is in the considered case. And what's with 44.1 kHz? So, as evident from the spectrogram (yellow for the Live and blue for the Santa), the Turtle products do not have such disadvantage. The Live was badly sñored for the main discretization frequency (48 kHz) as it was considered as alone to be blamed. However, the Santa operates at the same 48 Hz (which is not surprising as it is regulated by the As'97 Standard). Thus, good mixing algorithms are just the point! And one more note. As all modern cards (Vortex, Yamaha, Live) operate at 48 kHz, just the same frequency should be used in work with sound. 44.1 kHz may be used only at the final stages of implementing a music project and it is desirable that it is re-calculated from 48 kHz with the help of software. If you need to urgently digitize 44.1 kHz source, I would recommend to apply 48 kHz sampling (just compare distortions levels at 44->48 and 44->44 on the spectrogram). I know a lot of people who completely reject any measurement results when it comes down to sound. I can go with them only on the fact that quantitative estimations are not a sufficient condition for good sound. Nevertheless, if these prejudices are disregarded we may tumble into a marsh of verbiage and unclear definitions. It is most likely that the optimal variant is between the exact measurements and analyses of aural perceptions. The drawback of measurements is that they are not perfect and some sound features cannot be measured and taken into account. The main advantage of measurements is their objectiveness. Various aural perceptions are lacking just in objectiveness. Here strong influence of physiological stereotypes expressed by famous persons, personal preferences of a tester and difficulties in memorizing and comparing perceptions separated in time play their role. And there exist "masochists" (who may not even suspect about that) whose logic is "the worse - the better". So, if you want to enjoy your choice and not to choose the best from the several variants I strongly recommend you to forget about all weighty opinions and rely only on your own perceptions. As soon as you feel that it is just for YOU PERSONALLY, buy and don't hesitate. If you still would like to make an experiment with listening try to be as objective as possible. For independent estimating I called in the aid of a disinterested person with good ear for music. At this time it was my brother George, a trumpeter by profession. I did not tell him anything about the experiment, just gave him a sheet of paper and seated him so that he could not observe my manipulations on the monitor. Then we made several "blind" Santa Cruz vs. Live tests. In arbitrary order we listened to various music compositions (modern instrumental and jazz, 256 bit/48 kHz MP3 files) with one card and the other. George noted which of the variants he liked more and why. Once we listened the same music at one card twice. But my brother put two and two together very quickly. Furthermore, in all 10 cases he differentiated one card from the other. Then I told him the names of the cards and wrote down his "verdict". "At first differences can be heard at once and without any stupid "blind" tests. In general, I liked the Live more although it reproduces music more noisy and "dirty" but sound is true and natural. The Santa Crus reproduces music without noises but lifelessly and unnaturally as synthesizer does. Instruments timbers differ significantly from the real ones. Sound is too "flat". That's all." And now briefly about my impressions. Frankly speaking, I was bowled down a bit but in general I liked the sound. Firstly, there were much less noise and distortions. Secondly, high tones were very pure and "ethereal". I noticed only two drawbacks that are a poor "panorama" (no sense of "volume") and some "dryness' of sound (though some individual like the latter). To summarize, I would like to note that I hoped for better things from 20-bit DAC. Then I alone listened to CD music reproduced by WinAmp through the plug-in allowing to read CD-DA through a bus. I listened to two CDs: acid-jazz Miles Davis's album "doo-bop" from Warner Bros. Rec and Chaikovskiy's Symphony No 6 si minor performed by Orchestra Sinfonica della Radio di Lubiana, a CD of "i Grandi Musicisti" series, DDD. Classic music is much better played by the Santa Cruz. The fact is that dynamic range of classic music recording is much broader than that of other music genres. And it is rather boring to listen to the Live's noises from the frontal output. In this respect the back output is better but signal level is somehow significantly lower - an amplifier's "turn up" is needed. Everything was clear about midi before unpacking the box. A lot of brand software for creativity and a cheap built-in synthesizer. I would like not to waste time on such midi but DOS gamers would be annoyed (so let's nibble at the subject also). I tried to work with Digital Orchestrator Pro Demo. The sequencer is somewhat unordinary but cool. The main drawback is only one available frequency - 44.1 kHz. This is a travesty for the card with 48 kHz at the bus. Nevertheless, to test the Santa's sound in midi I recorded by Digital Orchestrator Pro Demo the attached demo-file "It's Saturday Night" by Jeff Batter with four audio and 10 midi-tracks. I cold also judge the card's effect-processor and quality of re-recording through the codec. For comparison, I prepared the same file through the Live too (recording by the mixer in "Digital Only" mode, all explanations are given below). Both cards contain the packaged GM banks. As obvious, "empty" timbers of the Santa are the most suitable for accompanying solo instruments. But the Live's sound is more living and the effect-processor is "purer". But these are very delicate perceptions and of course tastes differ. You may have already noticed, the control panel of the card supports the option "activate MP3 acceleration". Take my word for it, upon activating this option MP3 files play at the same speed without any acceleration :)). To be serious, I could not fix the offloading of my P!!!-733. No matter whether it was WinAmp, Window Media Player 7.0 or AudioStation for sound reporduction, I obtained the same 3-4% CPU loading for SysMon. The system requirements for the Santa are P200MMX, 32 Mb RAM (64 Mb recommended). So, the card is designed for quite sophisticated PC. Thus, I could not puzzle out the mystery of acceleration (in one the foreign reviews it was noted once that Celeron 300 without a cache provides 15% unloading but today such computer is only a worry and nothing more!). Let's hit upon a scientific explanation! When the article has been already sent to an editorial office, Antonych, my friend and opponent, agreed to be a "beta-tester" (or voluntary editor) of it. And immediately he found a pair of logic contradictions. At first, the myth about "apparatus" decoding 5.1 was unmasked. I admit I drubbed unintentionally this myth into my head: "The cards has a powerful DSP and supports 6-column sound. What follows from that?". Nothing yet. There are no drivers to realize this. Also there are no players supporting apparatus decoding. The only thing available is WinDVD which decodes 5.1. and directs it to 6 independent channels (and the newest PowerDVD 3.0 also). As evident, amplitude value of crosstalk is -80 dB. And it is clear what is the reason of seemingly "monophonic" sound. For a high-quality stereo-base this value should be reduced down to -100 dB as minimum. To put down questions I remind that volume sound support option was disabled. Even afterwards the try to expand the stereo-base in Sensaur customizations failed. Crosstalk did not reduced even by a decibel. I thought about canceling the mixer's customizations by the known "rulez" program AC97 Mixer, but its latest version 1.7 refused to work with the card. If you are seeking for a new sound card to replace the old ISA one but you don't want to choose from the Live! vs. Vortex2 or if you are going to organize a home-made cinema theater at your apartment the Santa Cruz is quite suitable for that. If you still desire to replace a good PCI card (Live!, Vortex1/2, Yamaha 7x4) by the Santa you should remember that there will be no dramatic sound improvement over all parameters. Owners of cheap $20 plastic "boom-boxes" may not worry because it is unlikely that they will be able to notice any difference. On the other hand, if you are a happy owner of $1000 Hi-End acoustic systems there is no need to you to buy the Santa Cruz (more importantly the Santa's digital output is fixed to 48 kHz, but CD has 44.1 kHz sampling - for getting rediscretization distortions, see the figure above). And what about ordinary users who can afford a sound card for $100-500. Yes, the Santa is just for them.